Open for business on weekdays only (I think), this particular shop serves Nyonya food. Basic homey meals such as noodles, rice, and light snacks are all available in the shop – as displayed / wirtten on their large chalkboard as shown above. Since I’m more of a noodles person, I opted for their Nyonya Laksa (RM5), so as my colleague. 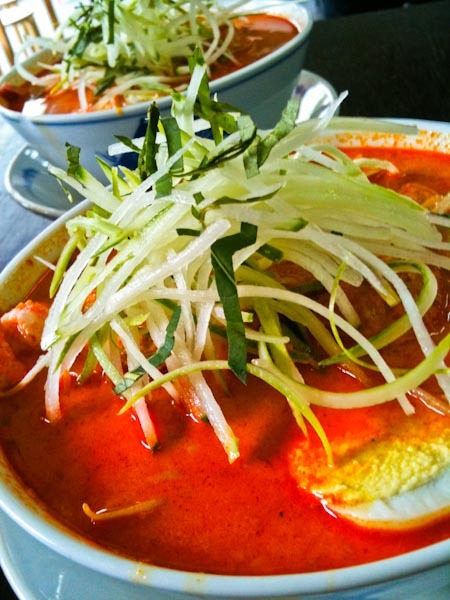 The broth was rich and packed with flavours and it wasn’t as spicy as it looked to be but it was sufficient to spur up one’s appetite without having to numb the tongue. If only they were generous with their toppings / ingredients, that would make it all perfect! 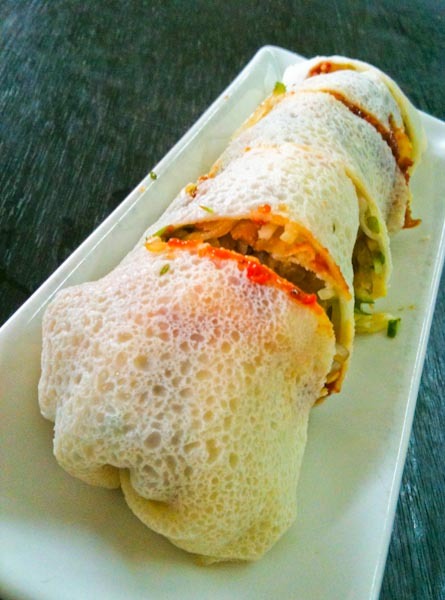 Apart from that, we ordered a roll of Popiah Peranakan (RM3) for sharing. Although it looks almost the same as the ordinary ones, that can’t be said in terms of ingredients they used. No wait… Apart from the special homemade sweet sauce they used, most of the ingredients are identical. 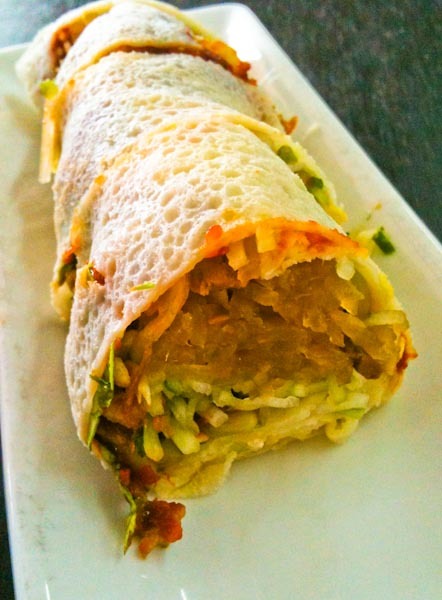 Cooked turnips, fried shallots, shredded cucumbers, egg strips and etc wrapped together in a popiah skin, it was moist and nice. Nothing to shout about this bowl of chendol (RM3). I reckon there are better ones out there. Now, I’m not sure how does a real Nyonya cuisine tastes like and hence, I can’t really judge on authenticity of their food. However, I do know that it’s quite good on its own even if it doesn’t follow the book (Nyonya style). Moreover, the price were quite affordable or at least it’s hell lot cheaper than the expensive food court I mentioned earlier. I go and be the judge. I am half Malaccan. LOL. Nooooo, Jason’s standard is too high. he will surely fail the place. Robin : I’ve to agree with this. Haha. J : Noted. Will try them out when I go there again. Huangfanling : Noted. 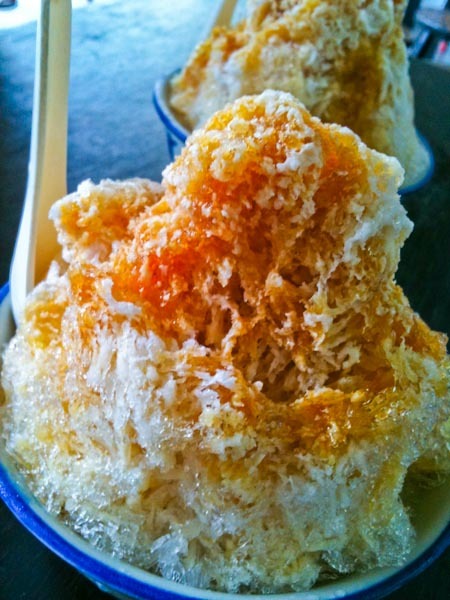 I shall give it a try if I’m in Melaka. Thanks for the pointer. @ Mr Chong : Thank’s and pls do inform me when u in melaka Erwin 017 610 8055… Cheers..